Kuwait, 06 November 2018: Europe is known for its large market for fruit juices around the world, where it continues to provide the market with innovative fresh flavors of juices. 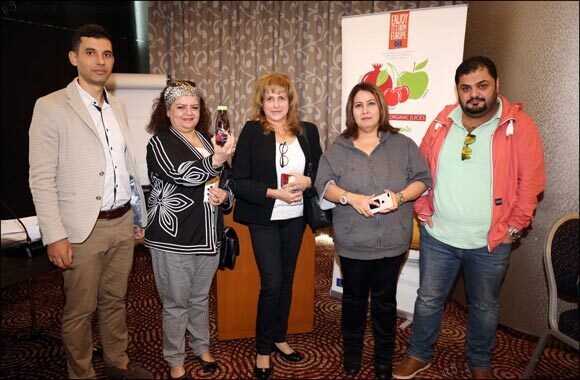 An informative event titled “European Organic Juices” for the promotion of Organic juices took place on the 28th of October 2018, at Four Points by Sheraton Kuwait, through the EU campaign. The event included a presentation of organic fruit juices; cherry, apple, and pomegranate juices, to the markets of Middle East: UAE, Saudi Arabia, and Kuwait. Each product is represented by one partner. The organic pomegranate juice is represented by ASOP, a producer’s organization, while the organic cherry juice is represented by BNHU, a non-profit trade organization, and the organic apple juice is represented by BIOROMANIA, an association of entities that are activated in the organic farming sector. The companies’ representatives and journalists had the opportunity for quiet conversations where they had to ask questions about how to cultivate fruit, but also how juice is produced, preserved and transported. Attendees, watched the presentation of the different organizations, tasted the varied flavors of the organic juices and discussed the import perspective product in Kuwait.